I thrive — and pride myself — on giving bespoke beauty advice to anyone that asks it of me. When providing actual product recommendations, it’s important to take everything from complexion concerns and skintones to budget into account. But there’s one category that I find myself recommending to nearly everyone that wants a personalized shopping list: setting sprays. Are you incomparably sweaty? You need a setting spray. Does your face inexplicably “eat” blush? Yes, a setting spray can help you with that. And if you are someone that works long days in an environment that demands perfection, then your introduction to setting spray is far overdue. Setting spray is designed to help keep makeup in place for as long as possible, while also keeping it looking fresh throughout the day, explains celebrity makeup artist Lilit Caradanian. She shares that they are essential to any makeup routine for multiple reasons — and likes applying hers before and after applying makeup for best results. The origins of this product are murky, but all can agree that it was designed simply to set a look in place — not to help improve application or create a more natural appearance. Some claim that drag culture is responsible for setting spray, with drag queens using hairspray to set their looks (fans of RuPaul’s Drag Race have definitely seen this at least once on the show). Others say that it was invented to keep stage and movie actors’ makeup in place, reducing the need for touch-ups. However, Allen Goldman, CEO of setting spray brand Skindinävia® believes that flight attendants popularized the product in the 1970s — until aerosols were banned for travel. “They were very sticky, kind of like a hairspray for the face,” he explains, “so they weren’t very good for the skin.” In recent years, however, the conversation around setting sprays has changed dramatically. Namely, they are now more carefully formulated than they once were, with twofold benefits: Not only are they something designed to lock down your makeup, but many product development teams look at them as an opportunity to treat the skin, too. You might think that a formula designed to hold your makeup down would be bad for skin. However, that’s not the case. “Realistically, setting sprays barely touch the skin and a very minimal amount is applied if sprayed correctly,” says Goldman. Caradanian agrees, adding that setting spray is very hydrating. 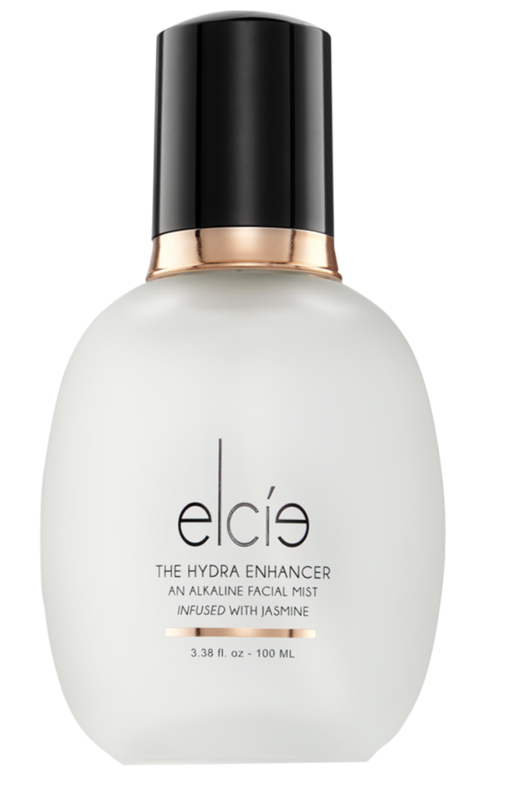 For example, the artist’s own brand, Elcie CosmeticsSM, features The Hydra Enhancer ($35), an alkaline water-based setting spray infused with jasmine. “We found a way to encapsulate the spray over a full day, which works by keeping the makeup cool,” explains Goldman. The natural heat of your skin (or even the oppressive humidity of your environment) is what tampers with your flawless look throughout the day. By helping to reduce the temperature of your makeup on your skin, the makeup lasts longer. “This prevents melting, drying out, or excessive shine on the [skin’s] surface,” he says. Another component that is essential to an efficacious setting spray is your application. Your product must thoroughly cover your entire face — without soaking it — to help protect your makeup. “It sounds simple, but a proper fine, even mist is almost impossible to achieve,” says Goldman, noting that the sprayers in Skindinävia’s bottles took three years to develop. To properly apply setting spray, you should shake the bottle, then hold it eight to 10 inches from your face (or an arm’s length, recommends Caradanian) before spraying in “X” and “T” formations on your skin. This will allow you to cover the entire face, Goldman advises. If you’re still not sold on setting spray, simply look at the market — possibly the biggest evolution in setting sprays is that they are seemingly everywhere. They’re available at all price points for a wide range of consumers, on the shelves in multiple iterations at all beauty retailers. That means they’re definitely not just for professionals anymore — and that we should all be using one on a regular basis. Skindinävia, gave Emily Orofino The Makeup Setting Spray to try. Elcie Cosmetics gave Emily Orofino The Hydra Enhancer to try.